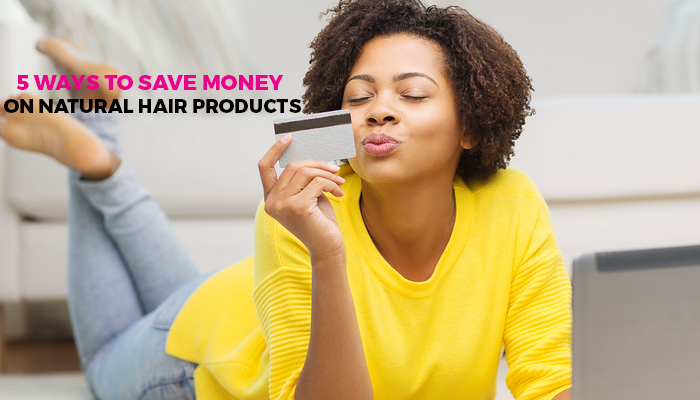 5 Ways to Save Money On Natural Hair Care! This post is inspired by a few reader emails I have received, that ask what can you use when you don’t have a lot of funds to work with. #1 Water is your FRIEND. To moisturize your hair you can use a liquid leave in or just plain old water will do just fine. #2 Some of your essentials are right in your kitchen! You can use oils that are commonly found in your household like olive oil to seal in moisture from water and prevent moisture loss, but if you can get your hands on something like coconut oil even better. #3 Try making your own homemade products. For only $3 to $5 you can get flaxseeds or chia seeds that will produce loads of hair gel. I was able to find some flaxseeds as low as $1.50 one time. You can even make your own DIY deep conditioners. The only downside is that you will have to store your DIY items in your fridge to prevent bacterial growth and some items you make will only be for one time use. When you do buy store bought products go light. Often times some of us over do it and we end up being way too heavy handed with product, causing product buildup. Product buildup will also lead to dry hair because it will create a barrier that will make it hard for moisture to penetrate. You absolutely need shampoo, conditioner, an oil or butter and a leave in conditioner is highly recommended. Aside from that styling products like hair sprays, edge control, or gels are optional.